EURUSD is under the influence of Manufacturing PMI and unemployment rate in Eurozone and Manufacturing PMIs (from Markit and ISM) in the US. 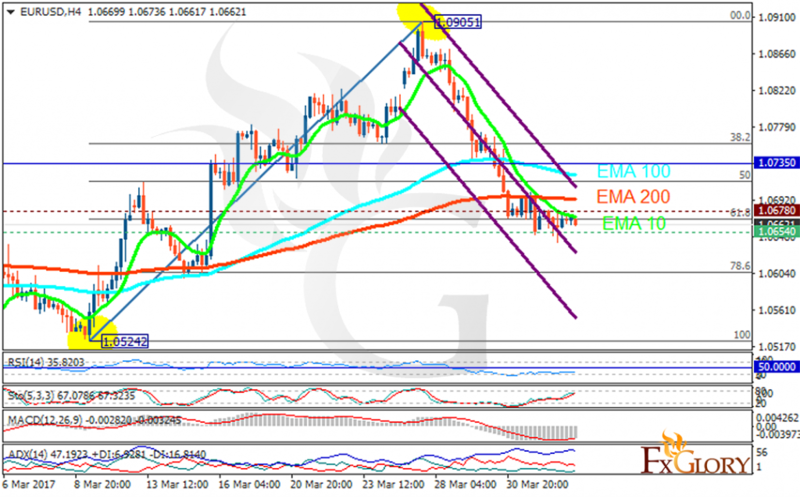 The support rests at 1.06540 with resistance at 1.06780 which both lines are below the weekly pivot point at 1.07350. The EMA of 10 is moving with bearish bias along the descendant channel and it is below the EMA of 100 and the EMA of 200. The RSI is moving horizontally near the oversold area, the Stochastic is showing downward momentum and the MACD indicator is in negative territory. The ADX is showing a weak sell signal. The pair will continue its bearish trend towards 78.6 level of Fibonacci; then the correction pattern will start soon rising towards the weekly pivot point.